The sun has went to sleep but the "glowing yellow light" still shine on us. 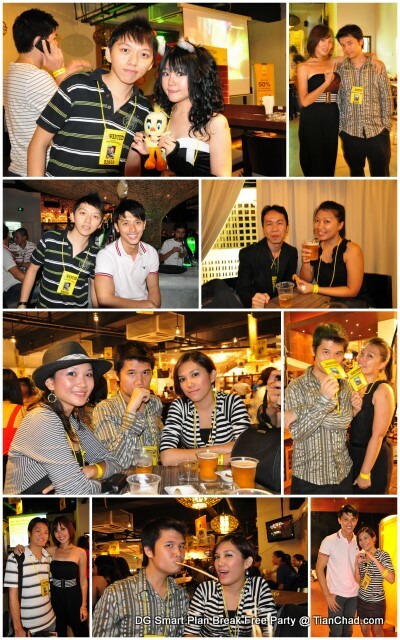 100++ bloggers and guests were gathered together at Ecoba (PJ Trade Centre) for DiGi Smart Plan Break Free Party. First of all, thanks to my "Smartphone can be Dumbphones" blog post which help me get a pairs of special invites from Nuffnang =) You can join this party too if you are a DiGi Evangelist~! At first, we were all locked up in the "Dumphone Jail"
Don't we looks like the birds that was trapped in the cage now? 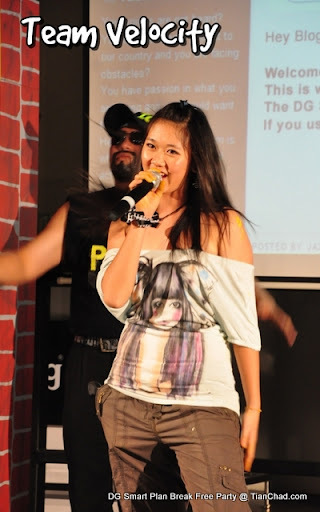 The party was started when we saw the emcee (Julie Voon) being locked up with chains. 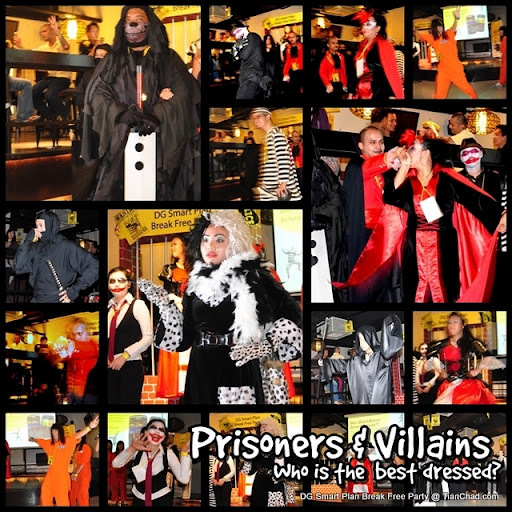 We the "prisoners" and "villains" were told to save her up by looking for the password to unlock all the locks. However we bloggers did what we pro at first, we snap Julie's-Being-Lock-Up-Photo then only go to help her. Most of us continue to take more photo of Julie until she shout for help. Haha, sorry ar, can't help taking more nice photo of you la. We went to the park outside Ecoba and look for the password that was hiding among the trees. Thanks for the dangerous fire-breathing Charmeleon that help us lit up the area. Never get to near to them ya, they are too hot! More and more keys were found to unlock the locks. We were given 3 To-do-list after Julie was saved. 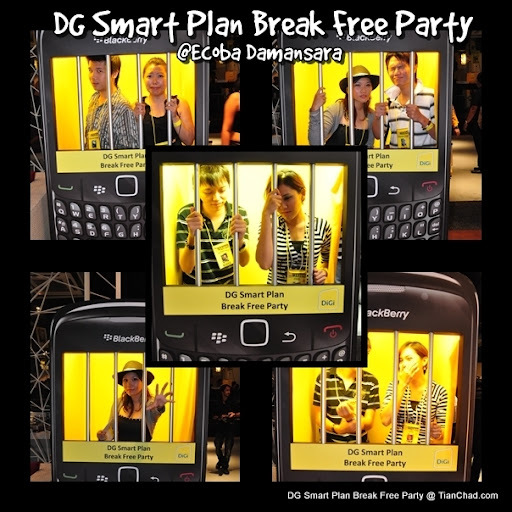 Each team will get a BlackBerry Curve 8250 equipped with DiGi SmartPlan to help us complete all three tasks. 3. Perform a group prison dance. We check out the task through Twitter and start brain storming for ideas. 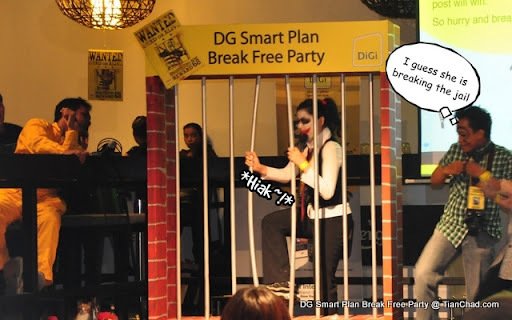 This is our war cry, "FREEDOM today, RM68 we pay, DG SMARTPLAN is the way~!". Short and simple right? =D All thanks to MsXeroz. 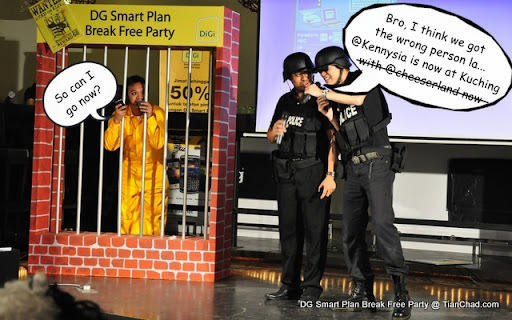 Second task we begging for mercy and pleaded the judges, "We beg and plead, fall to our knees, DiGi SmartPlan please set us free!" Third and last task, we were leaded by Aimar to do the Chicken Dance. Here is the only video I manage to record during the event =) Enjoy their Prison dance~! After all groups finish doing the 3 task, we all waiting patiently an hope for the best for the result. This is the small little torchlight that we won~! 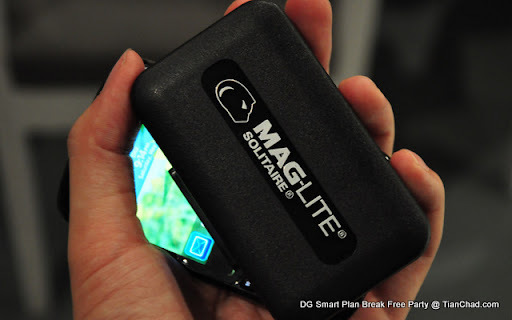 MAG-LITE SOLITAIRE. Because of its small size, I can now keep it with me almost all the time for emergency use . After the game finished, suddenly there was this yellow shirt guy being caught by the policeman. Attention: The following story line has been altered based on personal memory and insane creativity on telling a story based on the pictures. Apologies if there is any similarity with your story. It is all because of the so-called coincidence. Yellow guy was locked in the jail and wonder why he was being caught. Is it because he was eating too much? Because of the popularity and wide use of social media, one of the policeman can't resist to check if Yellow Guy have a Facebook account. 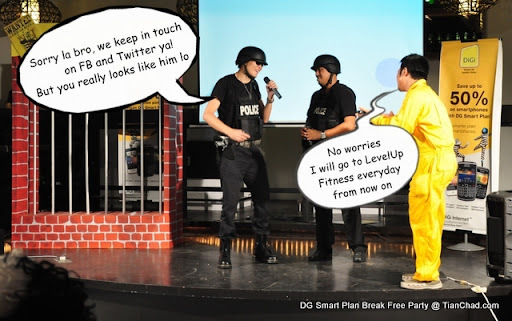 The policeman found out that the yellow guy is using the same telco internet package for unlimited surfing on all social media using Blackberry smartphone. 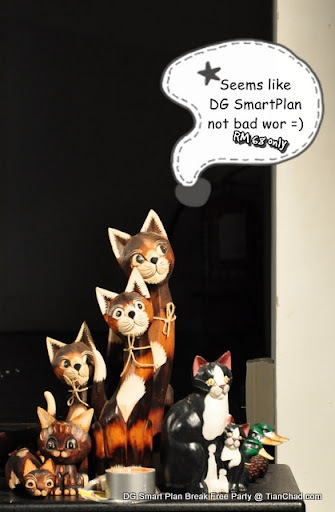 It is DG Smart Plan~! Suddenly the policeman saw the tweets from @Kennysia that he is with @Cheeerland her in Kuching now. Haha they caught the wrong person! In the end the policeman apologies for captured the wrong person and released Kenny Chia. They still keep in touch on Facebook because of the cheap mobile internet package and Kenny Chia promised to visit the gym more frequent to slim down. Why? To prevent being recognized as Kenny Sia again! The performance was not over yet. It was continue by Team Velocity's performance. 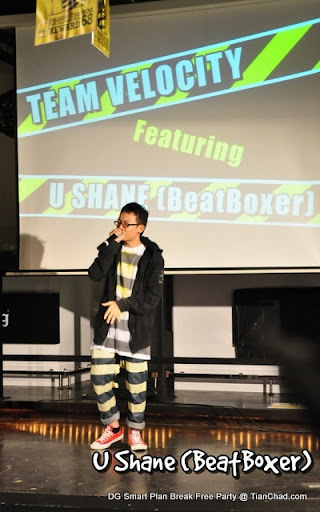 U Shane did an awesome beatbox performance. There was another challenge being brought up and it is to rap by referring to the above paragraph and follow U Shane's beats. First three who come up on stage finish the task can get the mystery prizes. Even the dolls have something in mind already. He is super duper tall, 1.89m ar! 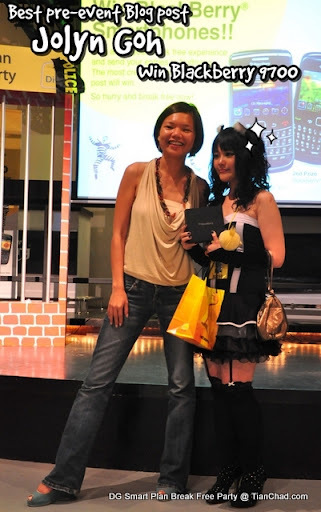 If you have read my "Smartphone can be Dumbphones" blog post , then you would know there was a HTC Legend waiting to be won by the Best Dressed Blogger. 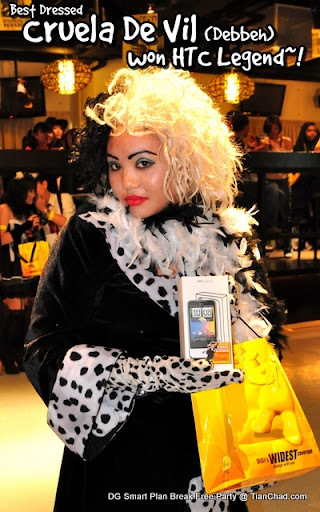 After a tough fight among all the prisoners and villains, Cruela De Vil (Debbeh) stand out and won the HTC Legend Mobile phone~! 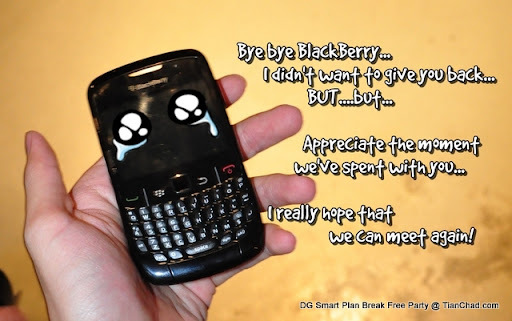 That means it is time for me to return back the BlackBerry Curve which was powered with DiGi Smart Plan....Hope to see you or your brother BB 9700 again~! 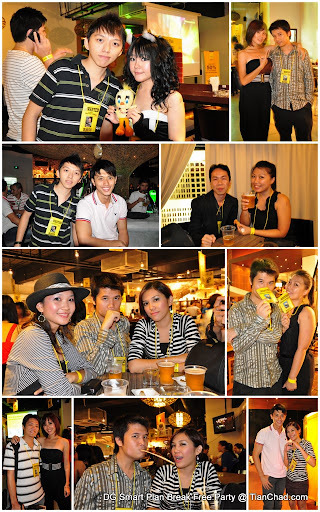 We mingle around with other bloggers and took our opportunity to take photo with the emce Julie Woon and other bloggers. Nice to meet all members of Chicanos Burritos [MsXeroz, Xeroz, AtreyuStrange, Aimar, YiWern, Jack "Marsboy", Rachel "Kokonut", Iriene and her family member] and I can't wait for attending another event like this again~! Please don't allow your smartphone to be a dumbphone okay? 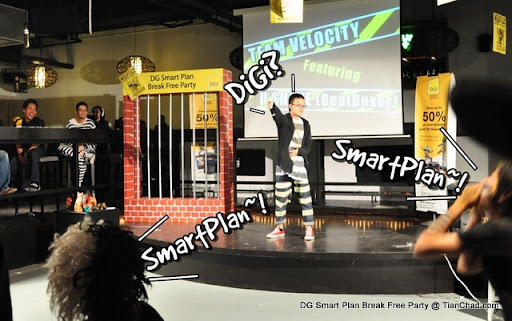 Visit DiGi's website to know more about the awesome smart plan. 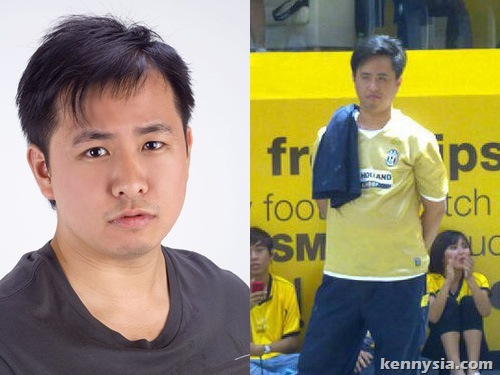 Who knows you might bump into Kenny Chia on FB? 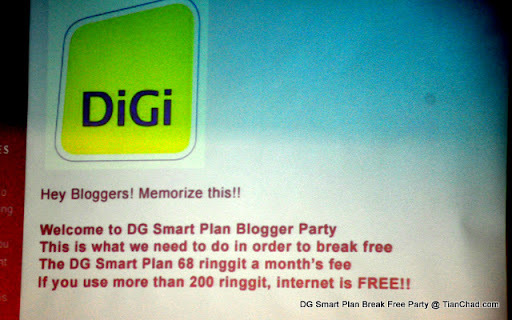 DiGi - Always the smarter choice~! Digi got the new idea. Cool! "Do you know you need creativity and efforts to win this contest?" - Best quote of the month! Haha! Ok, want to curi your pictures for my blog entry as well. Hope you don't mind, huhu~ I'm not gonna compete with any of you this time though, so good luck to all who participate to win the Blackberry! Hehe. I am very happy when people use my photo to blog ar, of course need to credit la haha. Thank you for the good luck~! Haha thanks! Do you know Chicanos Burritos won't rock without you? Creative friend like you are mean to be kept la. who say no need anymore? Haha ;p I guess they smelled teh tarik panas la, that's why~! Oh no~ TianChad, here's one of your competitor! and also from Chicanos Burritos too! Hope there's more events like this and we all can be a team again! it's the small things that lead to bigger things. i trust u'll have ur share. good luck tian chad! Yay yay =D Thanks for the blessing~! Nanged and clicked on your adv.! CONGRATULATIONS BRO!!! 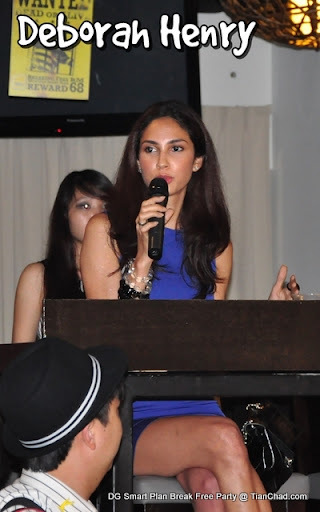 OK LET SHARE THE BB cut into two..ahaks..ahaks..
Woot! Thanks for the good news! congrats Tianchad! now BB edi, no more LG? lolol. Wah, new BB phone wor, congrats! Thank you =) I wonder how to pronounce ur nickname.